Microgaming started optimising all their online slots games for mobile devices such as the iPhone and iPad back in 2012 and all their new releases are now released for mobile and desktop in no download instant play format. Mobile gaming is going from strength to strength and the introduction of HTML5 has made it even easier to create stunning mobile slots. Add to this the retina display of the iPhone and you have stunning graphics and slots that are exceptional. You can play a range of the best free Microgaming slots with no download and no registration right here on our website. You can test them out for as long as you like and below you will find our top 3 iPhone slots from Microgaming to give you a head start. With the introduction of HTML5 more and more software providers have been creating slots games for mobile devices. This gives players more freedom to choose how they want to play and Apple devices are often the preferred choice. Apple has dominated the mobile market for a number of years now and the introduction of retina display on their devices has led to even better graphics. It has also meant that more and more software developers are creating mobile casino apps that incorporate swipe and tap features to be used with touchscreen technology. All you have to do is tap the screen to set the reels spinning and you can test it out for yourself using one of our top 3 featured Microgaming iPhone slots below. 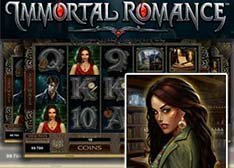 Immortal Romance: This is a 5 reel, 243 ways to win slot with a 96.86% RTP. It was released in December 2011 but is still a very popular choice with players. It is a vampire themed game with plenty of great bonus features including a 4 level bonus round. 5 Lion Door Knocker symbols will get you the big 60,000 coin jackpot and the maximum jackpot up for grabs is 3,645,000 coins. The Wild Desire feature is triggered randomly and turns up to 5 reels wild. The Chamber of Spins feature is the one to watch for though and 3 or more Lion Door Knocker symbols is required to open up this 4 level feature that is packed with free spins and multipliers. Each level is based on one of the characters and you can get up to 29 free spins and multipliers up to 5x for some exciting wins. There is plenty of action to be had in this Microgaming slots and it is easy to see why it remains a popular choice. 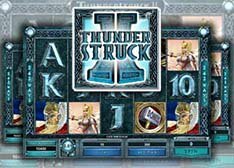 Thunderstruck 2: This is another 5 reel, 243 ways to win video slot with a 96% RTP. It was released back in 2010 and follows on from the original Thunderstruck game. It features the Great Hall of Spins features as well as a randomly activated Wildstorm feature. This game is perfect for all budgets and you can play up to $15 per spin. It is based on Norse mythology and features characters such as Thor, Odin, Loki, and Valkyrie. The jackpot is just 1,000 but there are plenty of wins to be had. The Wildstorm feature is random and will get you 1 free spin with up to 5 reels turning wild and the chance to win big. The main bonus feature is the Great Hall of Spins which is a multi-level bonus feature. Access is granted when you get 3 or more Bonus Hammer symbols and each level gives players free spins and multipliers. Players can get up to 25 free spins and multipliers up to 6x. There is plenty of action and adventure to be had as well as multiple chances for winning combinations. 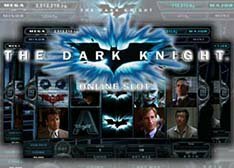 The Dark Knight: This is a 5 reel, 243 ways to win progressive jackpot video slot that is based on the 2008 film of the same name. Batman and Joker are the symbols to look out for in this game as they give out random rewards such as cash, wilds, and free spins. Spins start from as little as 0.30 and go up to 6.00 per spin making it suitable for all budgets and there is a maximum payout of 4,000,000 coins up for grabs. Cinematic spins are used which means you get to see real clips from the movie when you get a winning combination. Batman and Joker appear randomly in the base game and the Joker scatter symbol triggers the free spins feature. Get 2 of these anywhere on the reels and you get 15 free spins with a 2x multiplier. You can increase the multiplier up to 5x if Batman or Joker appear again rewarding players with extra free spins, and more. If you are a fan of Batman you will love this video slot from Microgaming. Microgaming has proved time and time again that they are the software provider of choice when it comes to great slots games. You can play a large number of their slots here on Grizzly Gambling for free with no download and no registration on your iPhone and if you choose to play for real money we can help you out too. We recommend our exclusive Jackpot City free spins no deposit bonus to all Canadian players. With this, you can test out the games and win real money. When you make your first deposit you can claim up to $1,600 with the Jackpot City welcome package. They give you 100% up to $400 on your first four deposits with the casino. That's a lot of free cash and a lot of free slots games. There are hundreds of top casino games to choose from and they can all be played on your iPhone, iPad, Android, or other mobile and tablet device.